B. Cavaliere, "Notes on Rothko, Flash Art, 86/87, January-February 1979, p. 38 (illustrated in color). D. Anfam, Mark Rothko: The Works on Canvas, New Haven and London, 1998, p. 467, no. 602 (illustrated in color). New York, Whitney Museum of American Art, Business Buys American Art, March-April 1960, p. 18, no. 18 (illustrated). New York, Whitney Museum of American Art, Art of the United States, 1670-1966, September-November 1966, no. 236. New York, Solomon R. Guggenheim Museum; Houston, The Museum of Fine Arts; Minneapolis, Walker Art Museum, and Los Angeles County Museum of Art, Mark Rothko, 1903-1970: A Retrospective, October 1978-September 1979, no. 145 (illustrated in color). London, Tate Gallery, Rothko, June-August 1987, p. 149, no. 60 (illustrated in color). "I am not interested in relationships of color or form or anything else I am interested only in expressing the basic human emotions - tragedy, ecstasy, doom, and so on -and the fact that lots of people break down and cry when confronted by my pictures shows that I communicate with those basic human emotions. The people who weep before my pictures are having the same religious experience I had when I painted them. And if you, as you say, are moved only by their color relationships, then you miss the point!" (Mark Rothko quoted in S. Rodman, Conversations with Artists, New York, 1957, pp. 93-94). A romantic at heart, Rothko famously maintained that his paintings were not pictures of an experience, they were an experience. "Free of the familiar," he maintained, "transcendental experiences become possible" and, through such an experience, a work of art could, he believed, become "miraculous a revelation, an unexpected and unprecedented resolution of an eternally familiar need." (M. Rothko, "The Romantics were Prompted") "What is wonderful about Mark," his friend Dore Ashton wrote in 1964, "is that he aspires, and is still capable of believing that his work can have some purpose - spiritual if you like - that is not sullied by the world." Brown and Blacks in Reds is an imposing and deeply resonant work from the height of Rothko's maturity that poignantly reflects these beliefs. 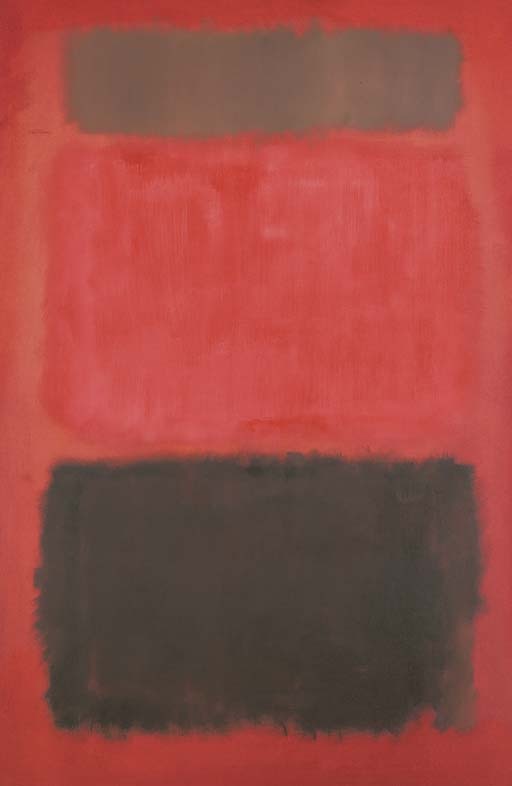 Painted during the crucial year of 1957 (and later mistakenly attributed to 1958 by the Sidney Janis Gallery when it was exhibited there that same year) it is a work that, with its three bold and contrasting rectangles of shimmering color stands as a classic example of Rothko's mature style. An extremely painterly work, it is also one that has had the ambiguous honour of being the only painting by the artist to adorn the interior of the famous Seagram building in Manhattan. Bought from Sidney Janis in 1958 by Phyllis Lambert, an architect and a member of the Bronfman family (the majority owners of Joseph E. Seagram and Sons), Brown and Blacks in Reds was the first work by Rothko to be bought for their renowned art collection. Since then it has formed the centrepiece of this remarkable collection hanging in the executive reception area on the fifth floor of Mies van der Rohe and Philip Johnson's celebrated masterpiece of modern architecture. When Phyllis Lambert bought Brown and Blacks in Reds she was seeking to assemble a collection of the finest contemporary art in the world to adorn what many people were saying was the most beautiful building in the world. It was her intention that the Seagram building should come to be regarded as a cultural institution with its collections, exhibitions, and its program of public art reflecting what she has described as the company's "sense of responsibility to the public in New York and the rest of the world." Lambert had known Rothko's work since 1954 and, thrilled with her purchase of Brown and Blacks in Reds, she conceived of a major commission for the artist. In the early part of 1958, along with Philip Johnson, who had recently been told by Alfred Barr that Rothko was "the greatest living painter", Lambert commissioned Rothko to produce a series of paintings for the smaller of two planned dining rooms at the Four Seasons Restaurant on the ground floor of the Seagram building. The story of the resulting series of "Seagram" murals which Rothko painted for this space--only to later withdraw from the commission because of ideological doubts he had about the morality of their hanging in such luxurious surroundings--is now the stuff of legend. Withdrawing from the commission and returning the money, the murals were eventually dispersed in select groups to the Kawamura Memorial Museum of Art, Japan, the National Gallery of Art in Washington, and to the specially-designed "Rothko Room" at the Tate Gallery in London. As a result of this parting of the ways Brown and Blacks in Reds remained the only Rothko in the Seagram building and a poignant reminder of this great but never completed project. With its warm pinks and reds and its cold brown and feathery black rectangles vying with one another in a play of radiant and earthy form, the colors of this warm and deeply spiritual painting in some ways anticipate the rich maroons and deep chthonic tones of the Seagram murals. The prevailing atmosphere of Brown and Blacks in Reds is however very different from the dark and heavy mood of the later murals which Rothko intended be so strong as to put the Four Seasons diners off their food. In contrast to these dark and heavy paintings which, from 1958 onwards, would increasingly dominate Rothko's art, the warm color, radiant light and shimmering forms of Brown and Blacks in Reds echoes Rothko's earlier paintings of the 1950s which had, among other things, reflected the influence of Bonnard. Most notable in this painting is the way in which Rothko maintains a dynamic and febrile balance between the strong colors and dark forms with the lightest of painterly touches. The intensely painterly surface of Brown and Blacks in Reds is of paramount importance in the attainment and the maintaining this balance. Intensely worked with a light feathery touch and using a broad brush, Rothko has seemingly "molded" the painted forms into almost three-dimensional blocks of color that, while dense and seemingly impermeable, are never solid, but, like dark rolling clouds on the horizon, constantly shifting both their form and their appearance. "My current pictures" Rothko had claimed in a lecture he gave at the Pratt Institute in New York in 1958, "are involved with the scale of human feeling, the human drama, as much of it as I can express." (cited in Mark Rothko ex. cat. National Gallery of Art, Washington, DC 1998, p. 346.) In Brown and Blacks in Reds this "human drama" is expressed through the heavy contrast of the light and dark rectangles. Generating two horizon-like strips that seem to, like the red sky of a hot summer night to threaten thunder, the intersecting of the three horizontal rectangles of colour instills the viewer with a sense of both transcendent beauty and a sense of foreboding. A testament to Rothko's painterly skill, Brown and Black in Reds is, like many of Rothko's works, infused with a pervasive sense of longing for transcendence. What is rarer, however, is that, through the carefully brushed and muted pink of the central rectangle a lightness and a sense of mystery is generated that breathes hope into what would otherwise be a sombre painting. In this way Rothko has managed through the use of simple form and color to instill a sense of both hope and futility, and to communicate these twin parameters of the human heart by "merging" them into what he called, one "single tragic idea." Christie's is honored to offer selections from the Seagram corporate collection in a series of sales this Spring and Summer. The famed Seagram building, designed by Mies van der Rohe and Philip Johnson and located on Park Avenue in New York City, is widely regarded as a modern architectural masterpiece and arguably the finest Post-War skyscraper. The building's refined elegance results from the dramatic use of bronze and travertine building materials, which are the structure's only embellishments. Phyllis Lambert, daughter of the Seagram founder, Samuel Bronfman, was instrumental in securing these architects for the project as well as initiating the company's art collection in 1957. Lambert has stated that "in public spaces, sculpture and painting were, in essence, part of the building itself." She selected works of art for the public spaces to enhance the aesthetic spirit of the building via the creations of the generation of artists contemporary with the skyscraper. The Seagram Collection was assembled by Lambert with assistance from Philip Johnson and MoMA curators and encompassed many different collecting areas. In addition to the Post-War and Contemporary works, the Collection included Impressionist and Modern paintings and tapestries by Joan Miró, Fernand Léger among other artists, as well as a Print collection, a fascinating group of 300 drinking vessels and a collection of preparatory drawings by minimalist artists and sculptors. The Collection also contains important pieces which, as a result of being shown in public, have come to be instantly recognizable for their association with the landmark building. Picasso's famous stage curtain, Le Tricorne is at the end of the procession coming into the building from Park Avenue entering into The Four Seasons restaurant's famed Pool Room. The hanging sculptures by Richard Lippold (donated to The Landmark Conservancy by Seagram) suspended over the bar and windows have become classic mid-century modern design elements unique to their environment. The vision extended to outside the building as well, where the Seagram Plaza played host to important temporary exhibitions of sculpture. The Seagram Collection was created to surround the employees with the highest aesthetic standard of excellence both inside and outside of the architectural monument itself. Its challenge was to illuminate aspects of our culture and to increase employee's interest in the areas covered by the collection. Interspersed throughout this collection are iconic works by Modern European and Post-War American artists acquired over 40 years by Lambert with major New York curators for Joseph E. Seagram & Sons, Inc.